I scanned through my previous conference highlights in preparation for scribbling my 7th NFU Conference summary piece. I couldn’t help but notice some reoccurring themes of food (hardly surprising I hear you murmur, we’re farmers), the future and the logistical masterclass the NFU puts on for its members. The 2019 conference of Our Food, Our Future seemed very apt as an industry that is worth £113bn looks to a somewhat uncertain future. So, as I rattle through my top ten highlights from this year, I’ll make the point early that the undertone of uncertainty caused a rather melancholy mood in this farmer from Leicestershire. It was soon replaced by incredulity. The position the United Kingdom finds itself in with a parliament’s MP’s squabbling over what party they do or don’t want to be in or what leader they will or won’t follow. It could have saved us a lot of angst if we’d just had this bust up in the Commons 2 or 3 years ago and saved us falling out with Europe, the home nations, families, ourselves and the Japanese manufacturing fraternity. Here ends the party-political broadcast for the ‘Know it-all Hindsight Party’. 1. After that controlled rant it seems fitting to then give the number 1 billing to Steve Richards, writer, broadcaster and political commentator. It appeared, during his session, that we might have been at an outside broadcast, live on air as the ‘Tory Three’ joined the Chuka Umunna’s S Club 7. It’s not often politics get’s my undivided attention but the impersonations and idiosyncrasies of Teresa May, Tony Blair, Alan Johnson, Gordon Brown and Jeremy Corbyn were an engaging punctuation in a lively Q&A with Terry Jones. Eventually we did get back to the impact of Brexit on Farming but quite frankly it was extremely illuminating for a mainly rural audience. 2. 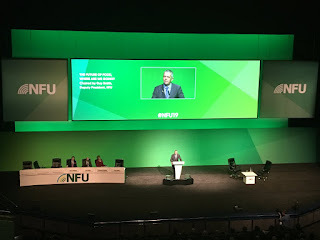 I’m not going to sing Minette Batters praise’s quite as many times as Michael Gove did during his conference speech, but I was extremely impressed in the assured and considered way in which the NFU President opened the Conference. Taking the Secretary for State to task on several occasions and providing a glorious retort to Michael Gove ‘over my dead body would British Standards be undermined… Minette said she was reasonable …. didn’t want it written in blood…but did want it written in ink. In the lead up to conference, 'the view from the President's article' in March's British Farmer and Grower was positive and proactive. It eluded to the part farmers will play in reducing green-house gas emissions and the contributions farmers will have in the meat and plant-based diet debate. The closing address recognised that her leadership would be judged, not on speeches but delivery, actions and outcomes. 3. The Secretary of State for Environment, Food and Rural Affairs, Michael Gove is an astute politician, but there was a lot he couldn’t or wouldn’t say about the forthcoming weeks. I suspect giving Mike Rowe’s email address out to the assembled throng, to enquire about RPA payment delays, will lead to meltdown in the DEFRA e-mail server. I wasn’t let down as the speech unfolded and my favourite subject of alliterations began to ‘trip tenaciously throughout the talk!!’. Starting with some old favourites such as food and farming, we had ‘roll-on roll off’, shirk and shy, places are palatable, meet and master and my favourite ‘a hotter and hungrier world’. 4. Jack Bobo, Vice President, Global Policy and Government Affairs, Intrexon Corporation was just the sort of speaker who livens up proceedings. His comments on how we are approaching the most important ‘30 years on the planet’ and probably the ‘most important 30 years we’ll ever have’, were a stark warning on climate and population growth. His equation of Hazard x media exposure = 'perception of risk' is one which should be retweeted after every social media scare story! 5. The combinable crops board breakout session is certainly up there with the best I’ve attended in seven years. 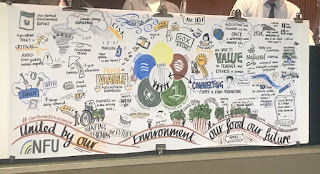 Jack Watts and Tom Bradshaw gave a polished ‘double act’ and BASF’s Mike Green gave clarity to the world of natural capital in modern day farming. 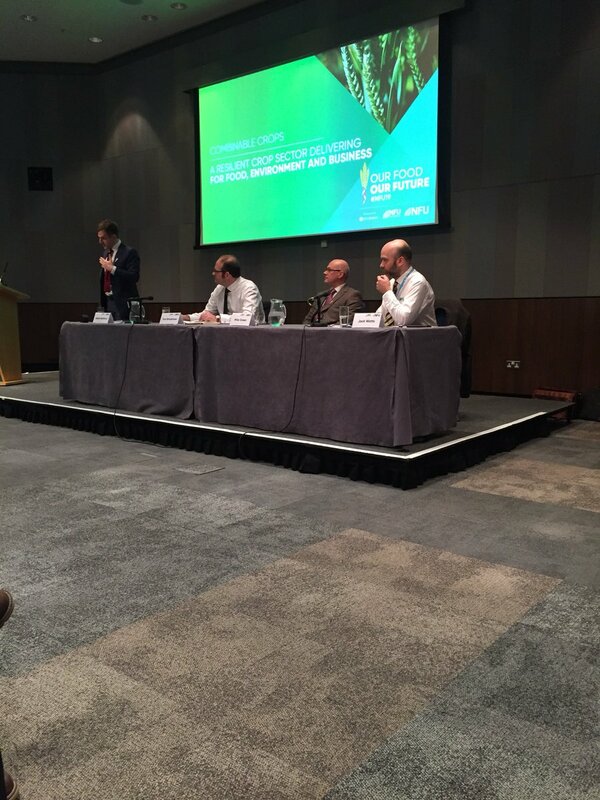 There were 40 minutes of extremely positive probing questions to round off a session expertly chaired by Adam Bedford. Nick von Westenholz ‘next week will be a critical week’ acknowledging that recently every week has been a critical week. Terry Jones’ comments on Mike Rowe trending on Twitter after the e-mail address revelation. The Twitter ‘quote off’ as NFU East Midlands described Joe Stanley as ‘loquacious’ (talks a great deal) and Joe acknowledging that would be a triple word score in scrabble and then dropping ‘progenitor’ into a question to the secretary of state which had me exclaim ’eh-up’ and searching google for its meaning. I heard the term ‘Flexitarian’ a lot during conference and I was just wondering if the last time they had come to prominence was in an episode of Star Trek? 7. Meet Your Officeholders gave a rare opportunity to get the full team in front of the membership for some two-way dialogue in a Q&A session for those who tamed the temptation to ‘walkabout’ during the previous evening. 8. The debate and comments around a National Food Strategy, Commission and Food reporting in the media are essential for a constructive future. I commend you to read ‘TheFuture of Food 2040’ which Andrea Graham presented to Conference. 9. Smart meters for the RPA came out in one of the breakout sessions to improve performance, payments and practice. The source of this comment is not disclosed to protect the innocent!! 10. I always end with the high standard of food and organisation from those tasked with running such an event. It once again delivered the logistical masterclass. It can be a thankless task gathering speakers, stage managing an event to get just the right messages to a broad audience. Well done and thanks to those that sponsored and supported the 2019 Conference. The professional and grammatically correct conference summary will be out soon. See you on the other side of March!!! With the first NFU Farmed Environment Conference taking place in Westminster yesterday, The Allerton Project’s Head of Farming, Phil Jarvis, offers his top ten highlights from the day’s proceedings. “My feelings, as I entered the RICS building within the view of the Houses of Parliament, were those of dismay. I felt like the house was on fire and we were attending to the flowers in the garden and the vegetables in the allotment!!! 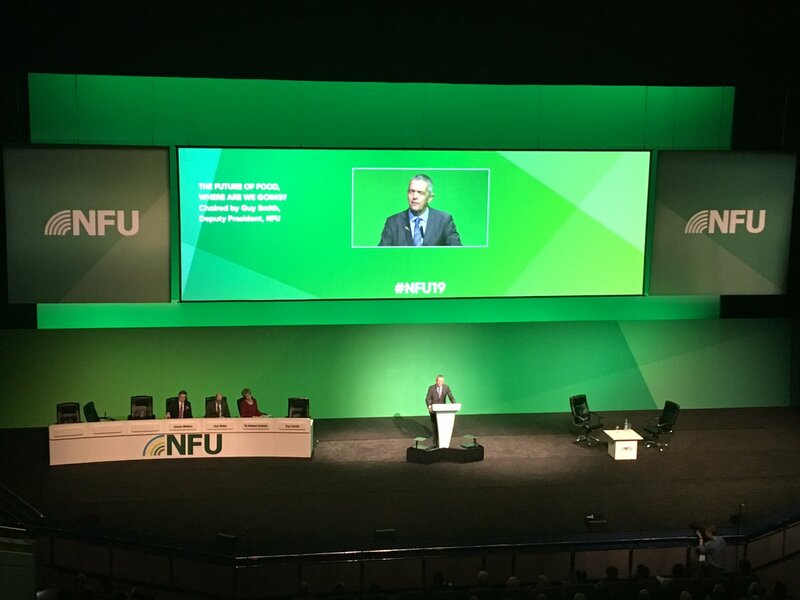 The fact that the NFU brought this conference into the middle of London to highlight the importance of the farmed environment and linking it to food production is to be commended. 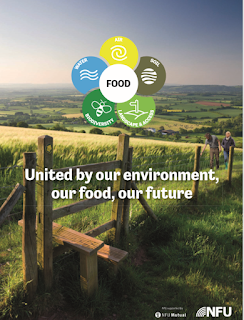 The report launched at this conference ’United by our environment, our food, our future’ is an opening gambit, some opening remarks for a wider conversation. The NFU will be continuing this debate will all of us for many years to come. Minette Batters opened and closed the conference emphasising that we need profitable businesses to deliver the public goods, society require, demand and expect. There were some clear messages about future investment in the countryside and looming trade deals. If poorly executed (and quite frankly the appalling events unfolding in Parliament don’t fill you with much confidence) we will miss the opportunity for change or export environmental issues to other parts of the planet. The NFU President stressed that farmers shouldn’t be complacent and there was still more work to do. Indeed, the Farmed Environment Report, whilst delivering a positive message about what farmers are already doing has over 40 references to where improvement can be made. I suggest some commentators who took to social media to express some negative views, read the document and look at how we take the common ground forward. It will be a much more constructive area in which to debate our differences. Working without farmers or introducing complex regulation to solve these conundrum’s is going to be a difficult circle to square. 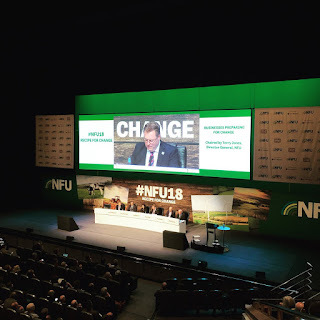 George Eustice, deputising for Michel Gove, gave some succinct comments on the Agricultural Bill and the future Environmental Land Management schemes. The questions were wide ranging, could such schemes ‘Bridge the Risk’ of new agricultural production systems? Can we really deliver meaningful agroecological approaches/Integrated Pest Management/Organic Fusion/Improved farming husbandry (Delete as required to leave your preferred phrase). After a long and winding question, the Minister expressed that this showed what was wrong with the CAP. Some might think the UK’s delivery of CAP might have to share some partial blame. The future, if the UK has one, will see our destiny in our own governments hands. No penalties or fines from Europe just the checks and balances from the Treasury then…brace yourselves!!! The questions from the floor. A grown-up discussion on reduced pesticide use, integrated pest management, farmers who weren’t so committed to the environment and water quality. Should we value food and biodiversity in equal measure, no ranting and raving (well only a little) but some well measured responses. 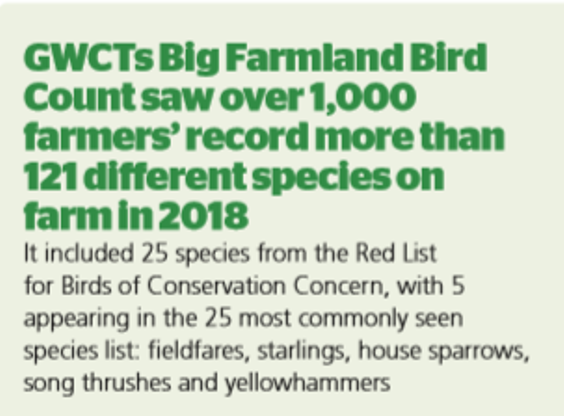 The tangibles came in the form of the NFU’s commitment and sponsorship of the GWCT’s Big Farmland Bird Count. It’s coming up in February 2019 and it’s time for farmers to take this to another level. I always like a bit of humour and Mike Green from BASF question to George Eustice about how he was getting on with his price list for Natural Capital got the chuckling muscles going. However, Minette Batters comments on ‘how much she enjoyed Paol Hoveson big kit!! !’ certainly lightened the mood in the room. We only lightly touched on regulation, verification, complexity of delivering workable future environmental schemes. There are threads throughout the report and speakers eluded to well researched but practical solutions, for practical people, to solve practical problems. At the risk of shooting myself in the foot with this article, I saw a very poignant cartoon this morning that said, ‘There are a lot of people writing, but not many reading’!!! Food for thought, but it brings me nicely to my concluding point. Our next generation…. Whether it be for the next generation of farmers or youngsters in our education system, it was great to hear the work the NFU is doing in this area. We must stop talking about the balance of food production and environmental responsibilities and get on with delivering more tangible benefits for those who will live with the results of our actions, with farmers in the driving seat. The bookends in this debate are the 25 Year Environment Plan and a ‘productive, profitable food sector’. There need to be some win wins for all those interested in our rural landscape. We just need to work out how the market place, farmers improving efficiency and some effective government policy deliver those win wins. 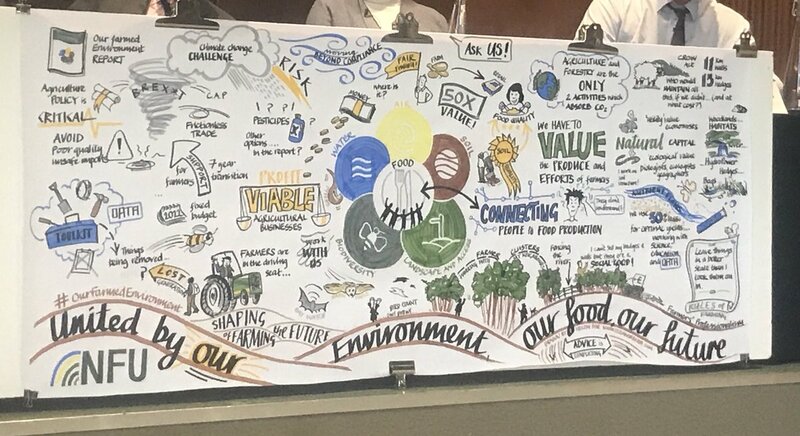 The real summary of this conference can be seen on this extraordinary piece of artwork, which I thought had been put together before the conference. Little did I know the artist was in residence during proceedings. Bravo!! 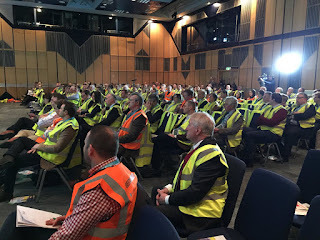 Here are my Top Ten highlights of the 2018 NFU Conference at the ICC in Birmingham. The theme was 'Recipe for Change', so lets see what ingredients make up this year's dish. The usual caveats about typos, grammar and spelling apply. 1. There was a rip roaring 'Food Business Session' with Terry Jones, the NFU's Director General, using his retail nous in the hot seat. He drew out 'loss leader' questions but expected 'quality brand' replies. Paul Muphy (Jordans CEO), Jo Whitfield (Co-op Food CEO), David Gunner (Dovecote Park CEO), Derek Wilkinson (Managing Director Sandfields Farm) and Arla's Managing Director Tomas Pietrangeli provided a lot of rat-a-tat-a-tat in this pacey panel debate. They covered food waste, trade, working with universities and farmers, labour, consumer messaging and they even slipped in the West African Trade Agreement. I was only talking about that in the pub the other day !! Quotes for consideration " We've got to get the 90% trade with the EU right before we turn to the 10% in the global market." "We're looking at strategic options, rather than strategic decisions." "Turning our worries into meaningful solutions". Great Stuff. 2. The trade session with Shanker Singham (Legatum Institute) and Julian Braithwaite (WTO Ambassador) showed conference that this arena will require serious negotiations. We'll need an 'Enigma Code Machine' just to understand the permutations of WTO rules, food standards, regulations, trade deals, quotas and subsidies. Although David Gunner from Dovecote later picked up that sometimes "Reality is different to making statements". These two speakers were cool, calm, collected, there was something reassuring about their soothing overtures. The official NFU report will give you a far more comprehensive report than I could ever assemble. 3. It's not often Michael Gove gets dropped into the mixing bowl as the third ingredient, but much of his speech's content had been kneaded and rolled out at the recent Oxford Farming Conferences and Government's 25 Year Environment Plan. A coherent food policy, with payment for public goods, review of current inspections, joined a promise to not undercut home market standards in the pursuit of post Brexit trade deals. It was 'all about alliteration' as the Secretary of State acknowledged Meurig's effectiveness as an 'advocate for agriculture'. Other phrases punctuated the prose such as, farm to fork, a consultation not a conclusion, contributions for conversation, future funding, productive and profitable -were rolled out during the Ministers speech. One tweet made me smile. But make no mistake Michael Gove is astute and charismatic, he is moving and shaking whilst whisking up this new agricultural era. He wants people to help him improve the recipe, rather than tell him you can't cook and eat it. 4. Four hundred folk registered for the Environment breakout session, that's a 400% increase from 2 years ago and had it to be housed in the Main Hall. Farmers realise that future support is coming from landscape schemes and public goods. This opportunity has to be grasped with a continued cohesive NFU policy that will recognise the opportunities that exist in both food production and farmland management. DEFA's Gavin Ross is talking a 'simplification and verification' message, rather than a 'complication and inspection' regime ,which is music to my ears. If farmers are to have a mindset change; others in government, industry, and civil service will have to follow suit, to help us deliver tangible environmental and food production goals. 5. Greg Clarke MP delivered the 'Trade Brief 'and whilst the government's industrial and Agritech strategy got an airing. There did seem to be a message of simplification a call for effective delivery of our R&D programmes and money commitments (£90m) were also promised. A theme repeated by others was a better pipeline between blue skies and applied research, this really needs to gather some traction - a simple diagram of the process would help the practitioners understand how the system could help agriculture's efficiency and productivity. 6. The 'safeguarding your people breakout session' sent a clear message to the industry, this is one ingredient that you can't substitute for anything else. Well done to the organisers for highlighting the need for improving health and safety on our farms. Every gathering need a health and safety meeting. A few of the usual suspects who probably have high viz safety pyjamas. Some of this campaigns great advocates. 7. It's sometimes easy to forget that flour, eggs and butter and key components of your recipe and need paying attention to. Dreaming of jam and honey from policies years away can lead to a 'shoddy show stopper' or a 'saggy signature dish'. With this in mind the NFU's commodity sessions are a reminder that the day to day farming issues still have to be addressed. We almost certainly can mitigate risk, market our produce better, review our machinery, buy energy cheaper or improve our breeding programmes. All of these will continue as the Brexit spaghetti unfolds. 8. Miles Jupp entertained the 1200 guests at dinner with such self- deprecating and understated humour, it had me gently chuckling at such a delivery of witticism. Some of his quickly worded observations about agriculture convinced me they were part of CAP policy. I was delighted for Richard Bramley who received the Meurig Raymond Award for his commitment to the NFU. 9. As I close in on the final few elements of out recipe for change, an emotional Meurig Raymond bowed out of his main stream involvement with the NFU. Meurig leaves the union in good shape, 14 years as an office holder, but decades of commitment to British agriculture. Words and phrase are sometimes difficult to compose when really you could write a book on his journey to our Farming Statesman. Thank you Meurig. 10. The banquet would not be complete without the conclusion of the officeholder elections. A current (not a currant) of energy, throughout the conference, provided heat for this contest to simmer on the hotplate. Congratulations to Minette Batters, who was elected as the new President with a substantial mandate. Stuart Roberts pushed Guy Smith all the way in the Deputy President race but had to settle for a convincing winning margin as he stepped into the Vice Presidents position. 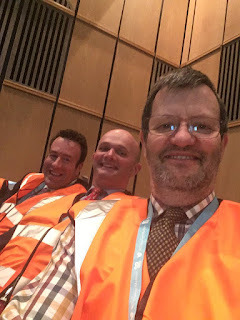 So as we leave 2018 NFU Conference, thanks to the team that put this event on, it is a mammoth logistical exercise which is expertly put together. It seems food is up the agenda, DEFRA is up the agenda, the environments up the agenda and we don't really need to make it much more complicated than that. The ingredients have been marinated, mixed and this 'recipe for change' has been added to the menu. Your full Conference report has been assembled here by the professional NFU chefs. Bon Appetit. 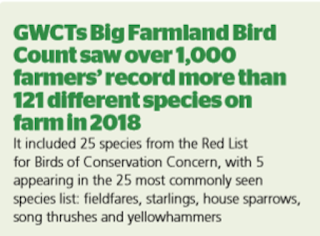 Over a thousand participants attended the two Oxford Farming Conferences last week, the GWCT’s Phil Jarvis reports on his highlights from the proceedings. “I managed to navigate my way through a number of events in Oxford, heard and saw plenty of signs that there is common ground. Several commentators talk about developing an organic fusion in approaches to food production and landscape management. This shared vision was evident in the architecturally stunning quadrangles and courtyards that hosted farming sessions. That is not to say there are different approaches or wide-ranging views in each camp, but the quicker this joined up thinking is presented to government the better the outcome is likely to be for the British countryside. I have highlighted OFC or ORFC initials after each highlight to show where mutual areas are shared. The Oxford Real Farming Conference with its four strands of farm practice, big ideas, growing and supporting a new generation of farmers and Brexit, made its’ way to the centre stage. Kath Dalmeny from Sustain made an admirable job of explaining what is in store and her props kept a complicated subject visually compelling. The Michael Gove Roadshow rolled into the town hall and the question and answer session with Zac Goldsmith was full of semantics which required code breaking to understand their full meaning. It was a championship performance in diplomatic replies from an astute politician. There is changes afoot in agricultural support payments and the ORFC audience certainly applauded the future environmental intentions. I then turned my attentions to the Oxford Farming Conference lectures in the Sheldonian Theatre. I am a great believer in delivery and style at big conferences. We spend an extraordinary amount of time dealing with the nitty gritty of everyday life and farming facts and figures. James Wong and Eve Turrow Paul gave polished and absorbing narratives on the challenges facing our industry and the ‘tribes’ of people that make decisions on the food that we produce, but they eat. Steve Murrells explained another sort of rejuvenation to a British institution. It was his message to the conference, to support and champion the Co-op as it goes about championing British produce, that hit home to me. I congratulate the organisers of both conferences, the humour from Caroline Millar at OFC certainly could have neatly fitted into a routine at the comedy night. I know her committee have worked tirelessly to put together the programme and the final day lunch was a triumphant taste explosion. Good food, good people, good farming. A quick photo blog from Amelia looking back on this years Rutland County show and Open Farm Sunday. Off to a great start with a sunny day. The sheep look lively, not sure about the cow! Farmer Phil and James embrace modern technology. Our visitors were welcomed by some friendly faces from Oakham YFC. Some great kids activities were on offer as part of the NFU discovery barn. A quick sit in the combine to learn about what we grow with Farmer Jim! Plenty of tractor tours around the farm- Our most popular attraction! South Devons in the sunshine. Plenty of animals to see! A big thanks to Kellogg's origins for the cereal for all our visitors! That'll do pig, that'll do......lie down. Huge thanks to everyone who helped make the day a great success! See you next time- 10th June 2018. Planning is well under way for our Open Farm Sunday, our gates will open on the 11th June 2017. 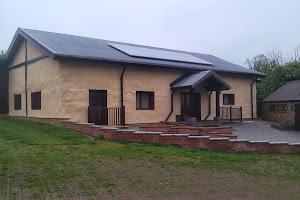 The Allerton Project, Hall Farm, Main Street, Loddington, Leicestershire, LE7 9XE. We know how important it is to share the farming story and ensure we have public support for British agriculture. The future of UK farming depends upon trust from the general public for what farming delivers in the world today. Open Farm Sunday gives us the opportunity to showcase this and ensure people from all ages and backgrounds engage with food production and the countryside around them. We’re sure to have a jam-packed, fun-filled day with tractor and trailer rides, local produce, Leicestershire Longwools, South Devon cattle, chickens, pigs, alpacas, farm machinery, children’s activities and more! So, do come and see us, suitable for all ages, grab friends and family for a brilliant day out on the farm! And of course, it’s free entry. Good food, good people, good farming. See you there!